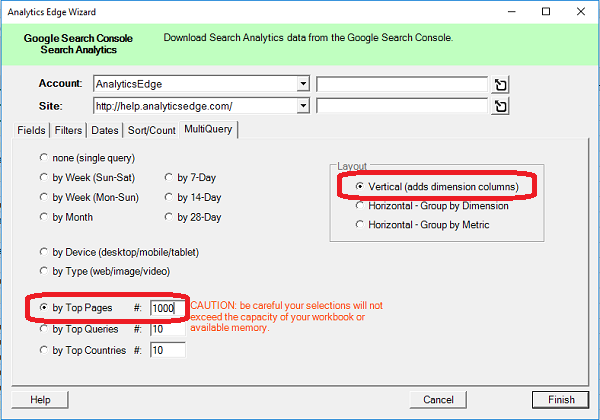 Downloading your Google Search Console data into Excel is easy with Analytics Edge. The Google Search Connector uses the API to pull down all of the query and page metrics — without the 1000 row limit imposed by the web interface. But even with the API, by including the ‘query’ dimension and the ‘page’ dimension together, Google can limit the number of combinations it makes available. You can get a lot more combinations if you make separate requests with just the query dimension, filtered for each of your pages in turn, then combine the results. While that sounds like it could be a lot of work, the latest Analytics Edge connector makes it simple: just run a ‘MultiQuery’ request for your ‘top pages’, and use a large number that would include all of your pages. Caution: asking for too much data can take a long time to download and potentially overload Excel. This entry was posted in Google Search on 2017/05/09 by articles.